When the feature was first rolled out, it was limited to videos you uploaded yourself. 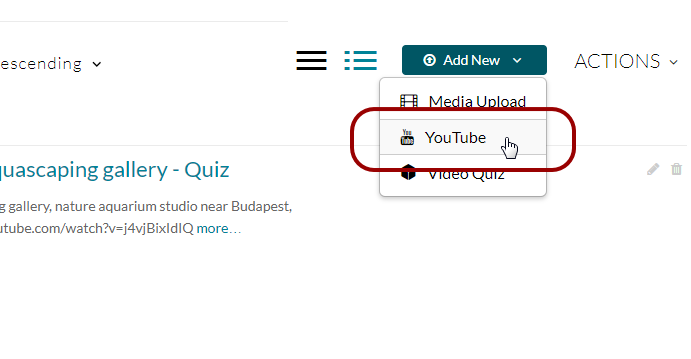 Now with the latest update, Kaltura has added a fantastic new feature that allows you to share a video from YouTube and build your own quiz on top of it. At the LX.lab Technology Showcase, we spent a brief session looking at how and why video quizzes can help build rich, blended learning experiences uniquely suited to the format. We examined how video quizzes can serve a huge variety of purposes, adding interaction that can then aid learner comprehension. Their value comes not so much from summative activities (evaluating what students can recall), but in formative ways, where they can help ensure your students are on the right track and are able to apply their knowledge, particularly in scenario-based videos. When designing a video quiz, think about the ways in which you can invite students to engage with vision, motion, and linearity. Imagine roleplay or process videos that ask “what is likely to happen happen next?”, or demonstration videos that ask “what was done well/poorly the scenario you just watched?” Think of on-site footage where students are asked to apply their knowledge by identifying elements in the frame. In a more direct instructional situation, consider a video that explains a complex topic, with a built-in quiz where they immediately follow up by answering a similar question, so that they can confirm that they understood the principle. If you’d like more information of creating Kaltura Quizzes, come speak to a Learning Design & Technology Specialist in the LX.lab, or view instructions at the Kaltura website. More general information about Kaltura can be found here.